It all starts with the memory of a chilled asparagus soup served with black salt. It was at a friend’s house and I was smitten with the combination. I immediately proceeded to buy black salt — i.e. Hawaiian lava salt — which added nicely to my slightly frivolous collection (never fewer than five or six salts in the house at any time). And the black salt became the wallflower of my pantry cupboard. Always there, rarely noticed. But every time I did, I thought of asparagus soup. Quite a few years later, here, then, is the ideal — though entirely optional — use for black salt. The soup requires only four ingredients and is very simple if the use of a food processor and then a food mill doesn’t seem like too much trouble. Prepare the leeks by removing all the green leaves, slicing thinly, and washing thoroughly to remove any grit. Peel the potato and cut into small chunks. Wash and trim the asparagus stalks to remove the tough ends. Reserve some asparagus tips to garnish the soup: about 8 to 10 tips if the asparagus is quite thin, or 4 to 5 tips to be each cut in half (lengthwise) if the asparagus is thicker. Roughly chop the rest of the stalks. In a medium saucepan, melt the butter and stew the leeks over low heat until soft (about 5 to 10 minutes), taking care that the leeks don’t color. Once the leeks have softened, add 750 ml (3 cups) water and the potato. Season with salt and pepper. Cook over medium heat for about 15 minutes until the potato pieces have cooked through. Transfer the soup to a food processor and blend thoroughly until the soup is as smooth as possible. There will always remain strands from the asparagus, however, which is why the soup then needs to be passed through a food mill (or a fine mesh sieve, but I’ve always found that to be much too fussy). The soup should be garnished with black salt or regular flakey sea salt and pepper, and/or a spoonful of crème fraîche. A recipe to arouse the taste buds amid the cloying seasonal onslaught of cookies and chocolate, Glühwein and Christmas punch. Cauliflower is a demure vegetable, and this method teases it from fading bystander to zesty leading lady. 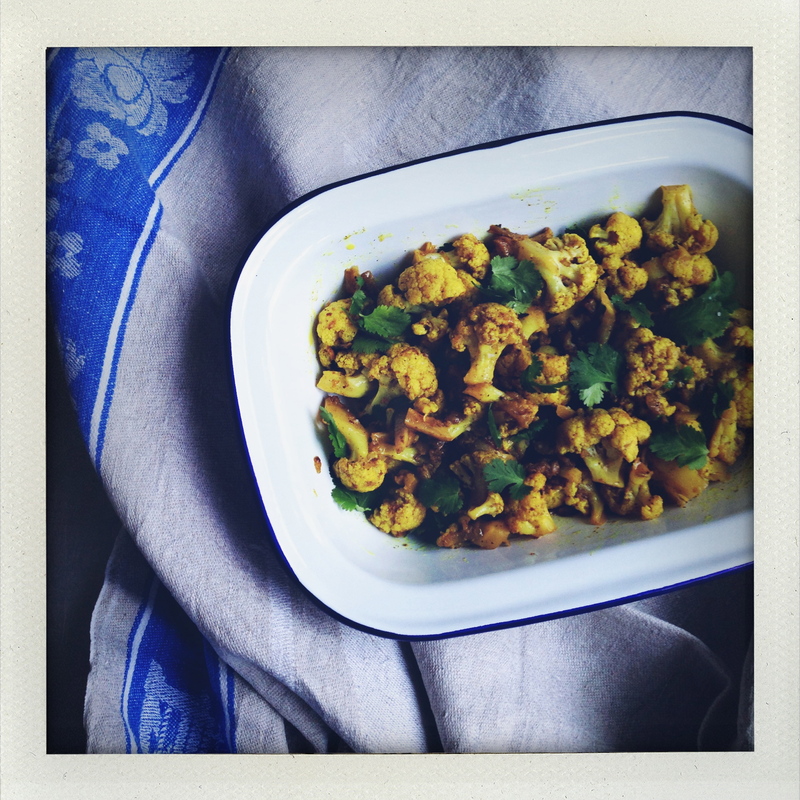 I first tasted this elegantly spiced cauliflower at Newman Street Tavern a few weeks ago. It was so good, so unexpectedly addictive, that we asked for the recipe. More precisely, my friend asked, I didn’t exactly dare. What’s more, it wasn’t the first time that evening — the server had just brought from the kitchen the handwritten instructions for an incredible fennel and watercress soup. Asking for another recipe from that delicious meal was pushing it a bit far, surely? Or perhaps not. It was of course, evidence of our appreciation. I had to extrapolate a little, especially for the spice mix, as there were no measurements. I’ve tested the recipe a couple of times and I believe this version comes close. In a small skillet, gently toast the cumin, anise, coriander, fennel. Just enough to coax out the aroma (be careful not to burn the spices!). In a small blender, grind to a fine powder together with the turmeric, paprika, and saffron. Crush the garlic and grate the ginger and mix into a paste with one teaspoon salt. Peel and finely dice the onion. 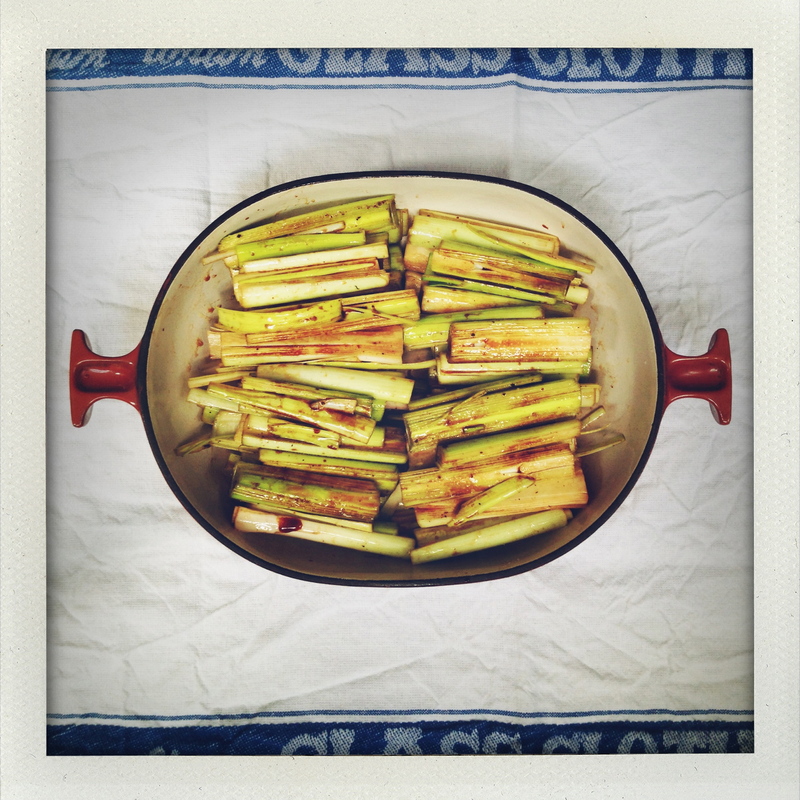 Cut the celery stalks into paper thin slices. Wash and cut the cauliflower into small florets. Fry the onion and celery until translucent then add the cauliflower florets with a splash of water. Cook for just a few minutes, until al dente. To finish the dish, season with salt and pepper, a splash of sherry vinegar and squeeze of lemon juice. Garnish with plenty of dill and/or cilantro leaves. Leeks are in season again. After a long bountiful summer of tomatoes, zucchini, artichoke, beans and tomatoes, more tomatoes — fall vegetables are back at the markets and it’s the time to start roasting. This is not only my favorite way to prepare leeks, it’s one of my favorite ways to prepare vegetables, period, and leeks are incredibly versatile and always a hit. They are a stellar companion alongside simply grilled fish and lentils. Or together with braised carrots and a roast chicken. I make them with a good steak and very crispy roasted potatoes. The possibilities are endless. This method is inspired by the wood-roasted vegetables from The River Cafe Cookbook Two (yellow). It is not exactly a recipe, and can be adapted to other vegetables and modified using different vinegars (apple cider, sherry) or perhaps lemon juice, and an array of herbs (rosemary, sage, marjoram, chillies…) depending on the mood. It is especially important to use very good quality ingredients. To clean the leeks, trim the roots at one end and darker leaves at the other, peel off the tough outer leaves, keeping only the tender green and white hearts, and thoroughly wash of any grit. Cut the stalks into 2-inch (5cm) pieces, then halve each of these lengthwise. In a large bowl, create a dressing of sorts with the vinegars, crushed garlic, olive oil, and picked thyme leaves. As in a vinaigrette, the proportions should be approximately two thirds olive oil, one third vinegar(s). In this case I would do half balsamic/half red wine. Toss the leeks in the dressing until well coated. Season generously with salt and pepper. Place the leeks in an oven-proof dish large enough to fit them in one layer. Slide the dish into the oven and roast for a good hour. Every 20 minutes approximately, gently toss the leeks. The leeks should be well caramelized and meltingly tender. Don’t hesitate to leave them in the oven a little longer than you think. Fall has come with crisp air and deepening sunshine, piles of fallen leaves to jump into and carpets of prickly chestnuts to tread onto, scarves without gloves and short skirts with leather boots, and apples, and apple sauce. Apple sauce should be made with the newest, crispest apples of early fall as a celebratory leap away from summer; but also with the last, gnarly, bruised, and slightly soft apples of spring in patient anticipation of the summer’s first strawberries; and all winter long through grey skies and rainy days, snow storms and frigid winds. Because making apple sauce is as easy as cutting apples into pieces and letting them cook for a little while, with a film of water at the bottom to prevent burning. But there are countless possible variations. Sugar or no sugar. Chunky or smooth. Spices? Even butter, for some. This is how I often make apple sauce, though by no means the only way. 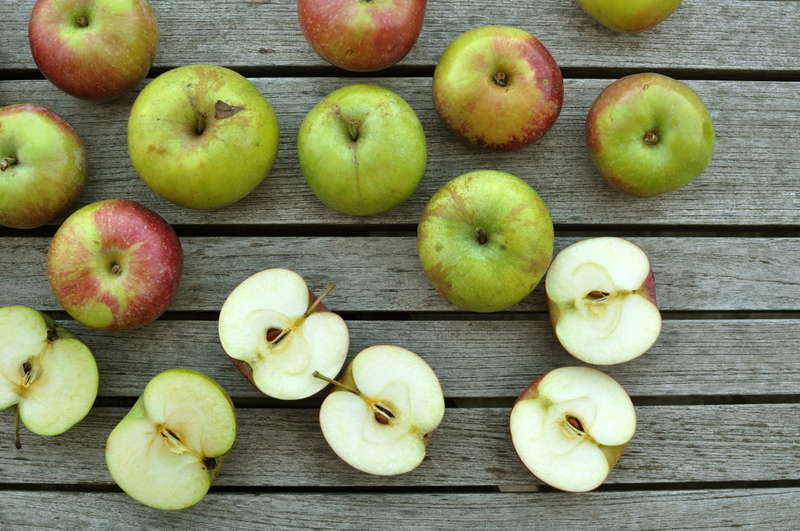 This makes an intensely fragrant, chunky apple sauce. 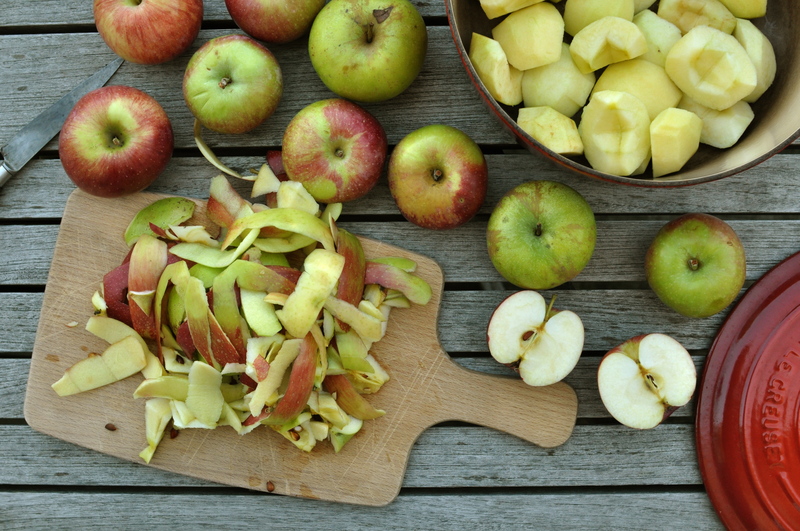 For a smoother texture the cooked apples can be run through a food mill. The spices and amount of sugar can also be adapted according to taste. I prefer fresh ginger and whole cinnamon because it imparts a more subtle taste, but ground spices would be fine, too. Peel, core, and cut the apples into quarters and place in a heavy-bottomed saucepan. Peel the rind of the lemon into a long ribbon, carefully avoiding too much pith, juice the lemon, and add both the rind and the juice to the apples. Peel the ginger, cut it into thin slices, and add to the apples. Also add the cinnamon stick and the sugar. Toss the apples. Pour in 2 or three tablespoons of water, just enough to coat the bottom of the pot. Cook, covered, over medium to low heat for 20 to 30 minutes, until the apples have softened. I’ve been in the mood recently to serve a somewhat more elaborate apéritif, tapas style, when we invite friends over for dinner. It’s convivial and frees up last minute cooking time since I then usually skip the first course. A typical apéritif includes marinated olives. Cherry tomatoes, radishes, or daikon radish depending on the season. Cashews or almonds, which I’ve just learned to dress up by roasting them with some spice. For something more substantial, I’ve often made salmon rillettes or chicken liver terrine. But as I was delving into Moro The Cookbook, I found this Spanish pork rillettes recipe. French rillettes don’t usually include overt aromatics. They taste like pure, unadulterated pork, in fat. They are delicious. This recipe uses pimentón (Spanish paprika), fennel, and sherry alongside garlic and bay. It’s different from the rillettes I knew; it certainly is no worse. I reduced the amount of pimentón for a more subtle flavor and added a note about the leftover pork fat, but otherwise the recipe is that of Moro the Cookbook. Preheat oven the 275°F (140°C). First trim the rind from the pork belly, then cut the meat and fat into roughly 2 x 1 1/2 inch (5 x 3 cm). Prepare the aromatics by roughly chopping the garlic cloves; in a mortar, lightly crush the fennel seeds and peppercorns; halve the bay leaves. 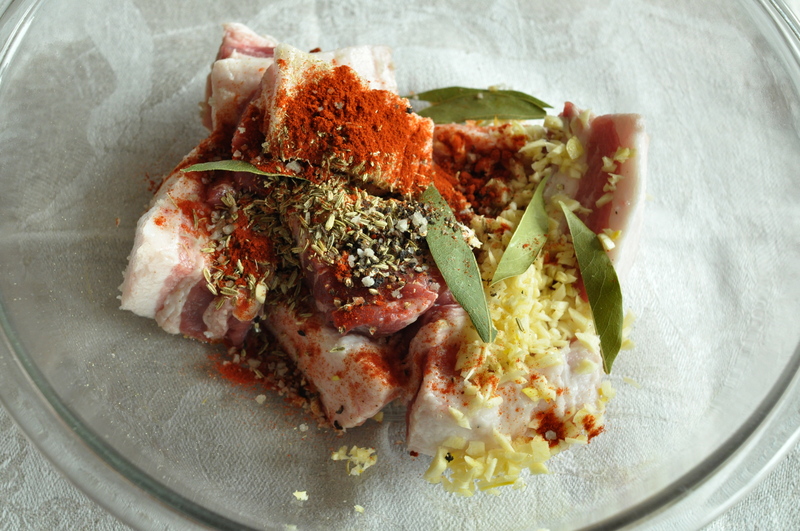 Place the pork and fat in a large mixing bowl and add the garlic, fennel seeds, peppercorns, bay leaves, paprika, sherry, and a good pinch of salt, and toss well with your hands to combine. Transfer to a 2 quart (2 liter) earthenware terrine or heavy cast-iron pot, seal tightly with foil so no steam can escape, and place in the oven for at least 4 hours, until the meat is very soft and can be shredded easily. Remove from the oven and strain the meat in a sieve, pressing with a spatula or spoon to release the juice. Put the liquid aside to cool, then in the refrigerator until the fat rises to the top and solidifies. Once the meat has cooled enough to handle, shred between your fingers. **This is best done when the meat is warm rather than cold, as it will become more difficult to shred. ** Set aside any pieces of fat that have not melted away (see note). When the fat on top of the juice had somewhat solidified, spoon it off and set aside. Add all the juice and 2 tablespoons of fat to the shredded meat. Mix well, season with salt and pepper, and put the meat back into the terrine or other earthenware or glass jar. Pack the meat gently and seal with a layer of fat about 1/4 inch (1/2 cm) thick. Keep in the refrigerator for at least a couple of hours before serving, and up to 2 weeks if well sealed with fat. Note: You could discard the leftover fat, but it seemed a shame to do so, so I placed it in a small skillet over very low heat, letting it melt further. I then strained the fat and kept it in the refrigerator, to be used on bread instead of butter. The pieces of fat that remained solid, brown and caramelized, we ate — just like that.